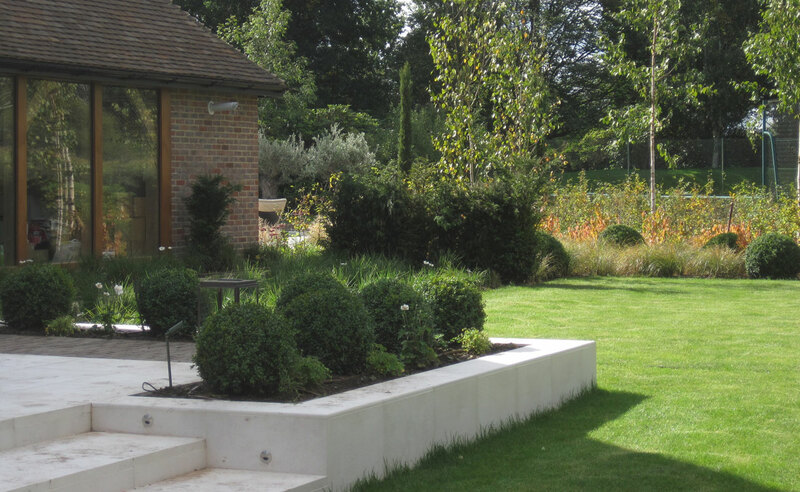 This large Surrey house was being refurbished and extensively modernised, which gave an opportunity to re-structure the layout of the garden. 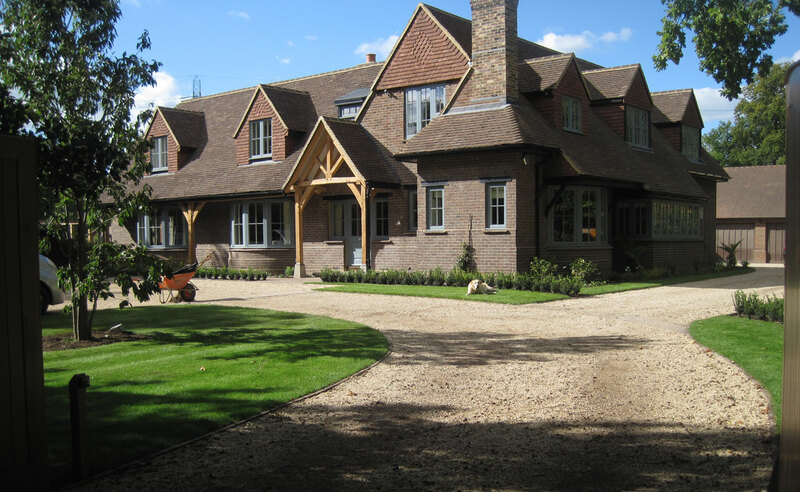 Previously the drive led straight to the back of the house, making the front entrance redundant and bringing all guests in through the utility room. Additionally, there was no definition between the garage/parking area and the main garden (so you were sitting in a car park! ), while a tennis court at an awkward angle dominated the triangular plot. 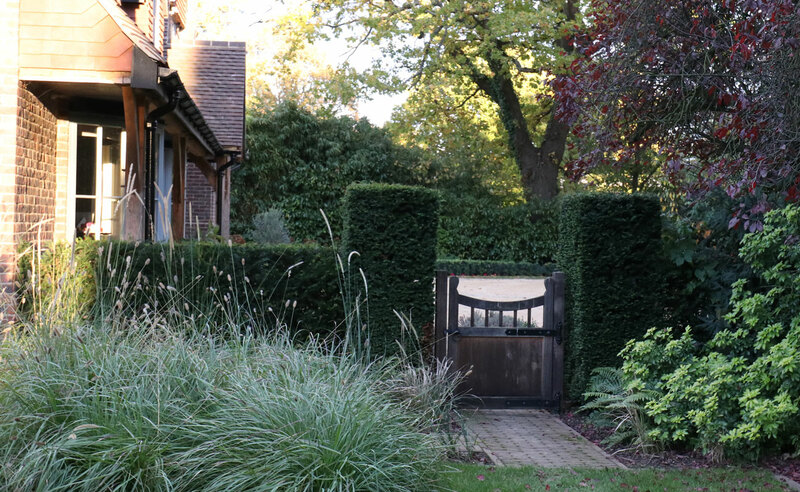 With a change in the angle of the entrance into the garden, the drive now directs you to the front door, sweeping to a large formal entrance courtyard. 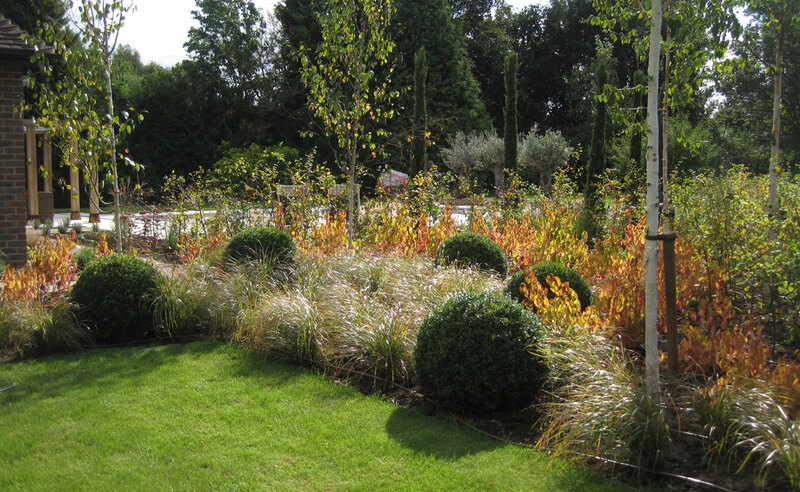 Detailing from beautiful Belgian bricks and features such as a double-row of tightly clipped box and standard Portuguese laurel trees underplanted with large drifts of textural planting in shades of white, including peonies, hellebores and foxgloves, reinforce the country setting with a soft formality. A smaller drive, for private use only, leads to the rear garage and parking area. This has now been separated from the main garden through the addition of a tall wall with a beautiful old stone arch that links the two areas. 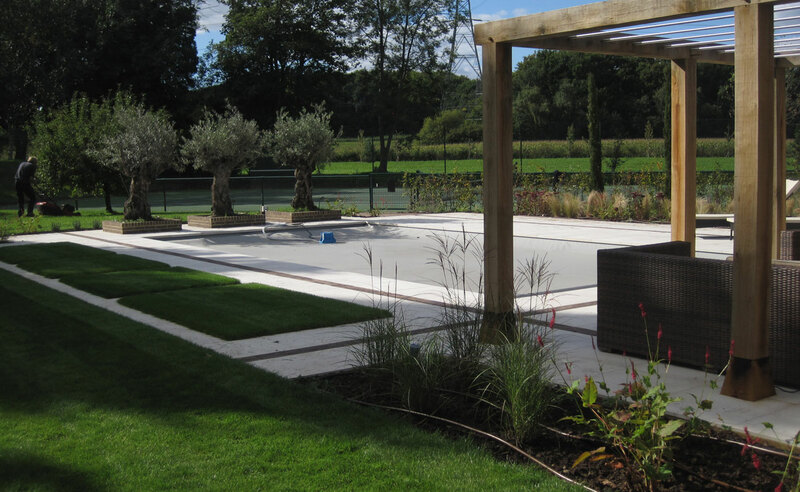 The original swimming pool was replaced with a beautiful outdoor pool, with porcelain and brick detailing; this pool was built by Falcon Pools with grey tiles to give the pool a lovely pale blue colour, much more in keeping with the English climate and light than a turquoise-lined pool, which always look very out of place to me! 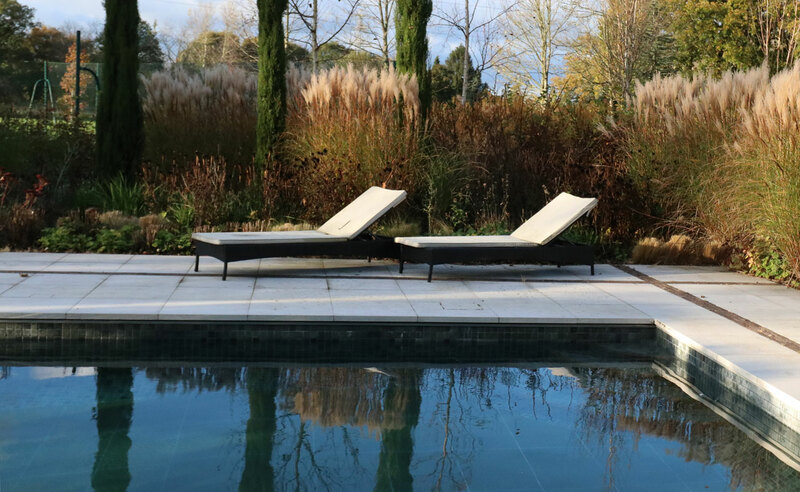 You can see a couple of photos of the pool on my blog award-winning swimming pool. 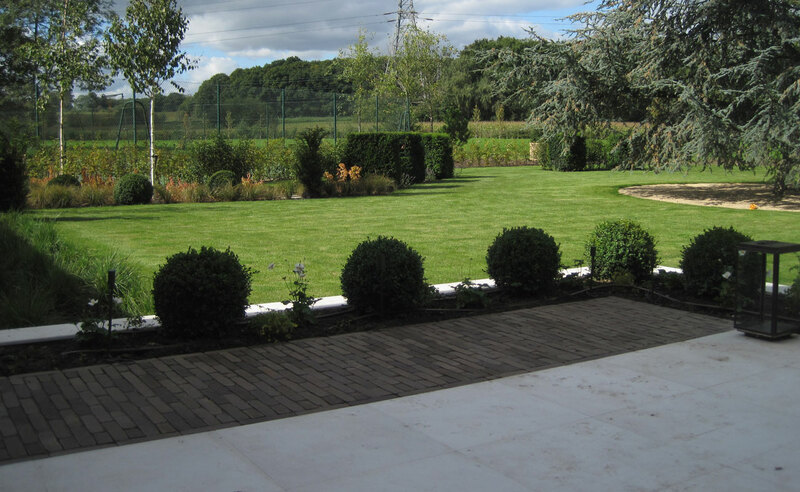 A new terrace now extends from the kitchen to create a large entertaining space that flows seamlessly from inside to out through a flush threshold; porcelain paving provides a light and low maintenance surface while brick detailing echoes the materials at the front of the house. 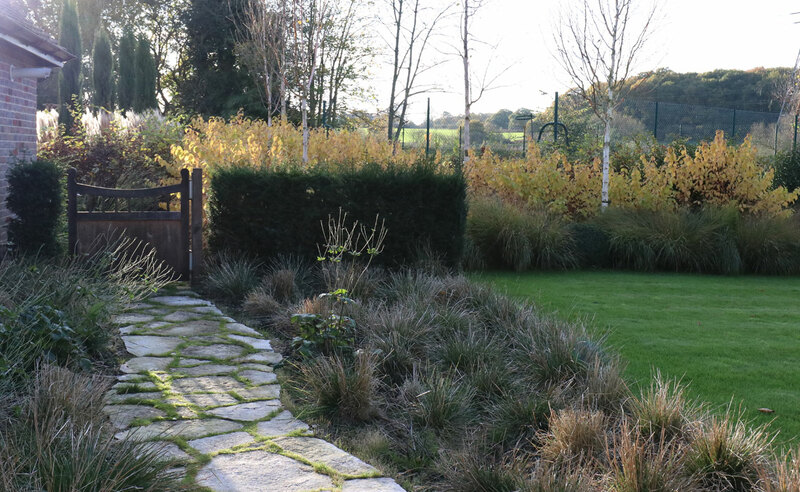 Wide steps, soft planting in amongst box balls, and a stunning David Harber Ekho fountain set within a small pool at the base of the wall, all help to create an intimate space within the wider garden. 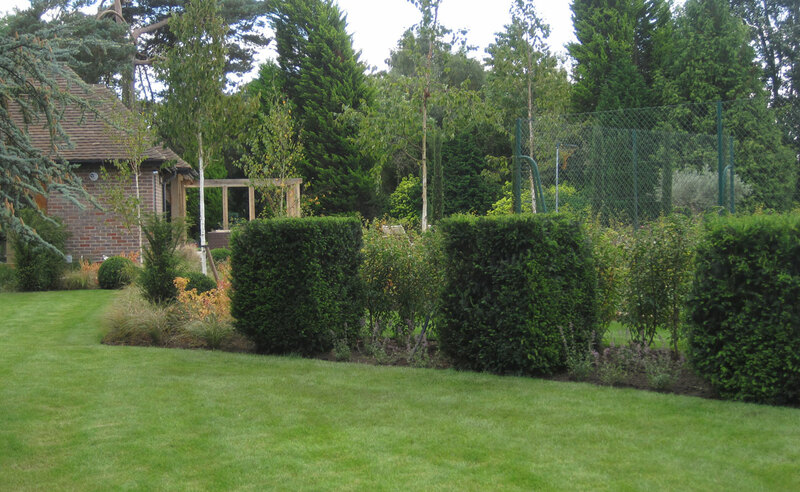 A large arc of yew blocks encloses this main garden further, while keeping the eye away from the tennis court; in time, newly planted hornbeam and Portuguese laurel hedging will enclose this completely, so that it will no longer be visible from any of the garden areas.